Traveling with kids is a daunting prospect, you plan everything with military precision and do your best also to pack plenty of patience. The wake-up call for me was the one time I flew with my baby and just threw everything into a holdall I had dusted off the night before — not a good move. Unlike the great explorers, most parents aren’t lucky enough to have a travel sidekick to organize their journey, so a suitable travel diaper bag is a must. Let’s take a look at the best travel diaper bags around and what you need to think about before choosing one. Use the links above to check the latest prices or read our in-depth travel diaper bag reviews below. Does Your Diaper Bag Count as a Carry-On? Each airline may have a different hand luggage policy relating to kids. If you’re unsure, it’s best to contact them before departure, but here are some general guidelines. Most airlines allow one carry-on per passenger; however, some — such as United Airlines — allow one diaper bag in addition to your carry-on (source). Regulations change frequently, but restrictions on the amount of liquid allowed in the plane don’t apply to baby drinks (source). In general, most ground staff are considerate when you’re traveling with kids and may be more lenient and make exceptions. Purchasing a travel diaper bag can raise questions you might want to ask before committing. Here are a few points to consider. Size it up: If traveling by air, you may have to check the airline’s size restrictions. Bear in mind the overhead locker might not be the best place to stow your bag. You’ll want this close by, like under the seat — so think about whether it’s likely to fit. Weight: Your bag’s weight is crucial for two main reasons. You’ll have to carry or lift it at some point. Plus, for air travel there could be a weight limit on carry-ons — you wouldn’t want half your allowance taken up by the bag itself. Comfort: You never realize how heavy a diaper bag can be until you unclip it from your stroller. Extra padding on the straps could prevent an aching back or shoulders. With backpack-style diaper bags, make sure you can adjust them for a good fit. 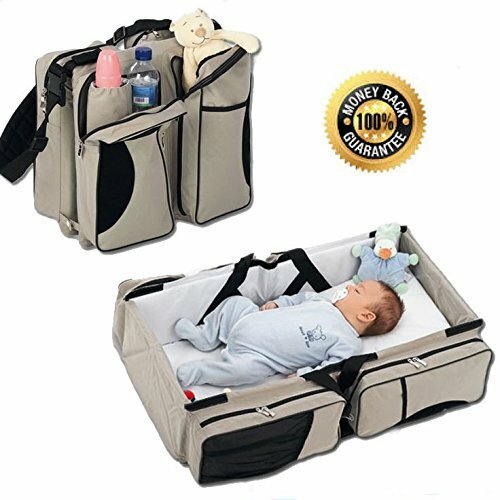 Accessories: For example, a portable changing mat will allow you to change baby wherever you are, plus insulated pockets will keep your baby’s bottle warm for a time while you’re traveling. If you’ve always wanted to try the minimalist lifestyle, now’s your chance, as it’s best to pack light when traveling with kids. However, it’s easy in theory, difficult in practice — you may need a lot less than you think! Now that we’ve been through the key features to look for in your next travel diaper bag, I’ve gathered my top choices to help you stay organized during your travels. Ruvalino has the perfect combination of style and functionality. If you’re looking to carry your baby gear on your back with elegance, this bag could appeal. 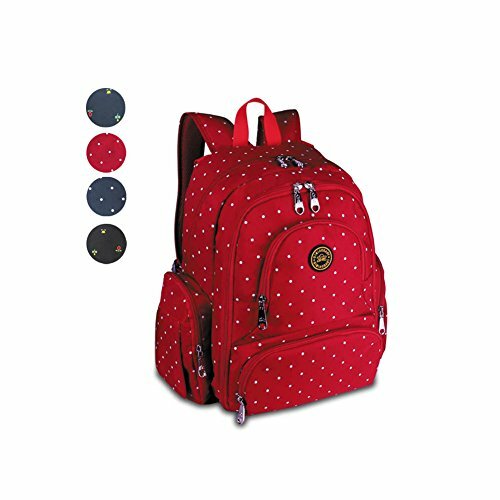 With one large compartment, a diaper organizer and three insulated bottle pockets, this bag gives you plenty of space. You even have a separate compartment to place mommy’s items. Most bags need two hands to operate the largest compartment, but this bag’s dual zippers allow one-hand opening, making your baby supplies easier to access. The extra-wide opening makes packing and digging into the bag a breeze. To store your valuables, phone, keys or wallet, don’t miss the hidden pocket on the back. Lightweight and strong material with durable stitches. Hand-wash only, so it could be tricky to keep clean. Some moms reported weak zippers. The Weekender is generous on size, which could be ideal for moms who tend to take too much stuff. The extra-large drawbridge style main compartment opens super-wide to allow easy access to your baby’s gear. The packing cubes could easily double as mini bags — great for keeping the essentials to hand. With a variety of zipped and open pockets, as well as a separate pocket for your cell phone, you’ll have a place for all the things you need when traveling with tots. With a large volume, it may become a challenge to carry the extra weight. However, a discrete back sleeve allows you to roll the diaper bag nicely over your carry-on handles, leaving your hands and back free. Large insulated bottle pocket with magnetic closure. Neutral design — appealing for dad too. Two way zip-closures to make opening it with one hand easier. Some moms felt the shoulder straps could be longer. Are you looking for a functional travel diaper bag that won’t put a heavy load on your back? Specifically designed for traveling, this bag could be a good choice. One of the plus points is the back strap — it allows you to slot the bag securely over your wheeled carry-on luggage. This means you should be able to move around freely, without unwanted weight over your upper body. I especially love the chic and classy design, it’s one I’d certainly continue using after my baby was finished with it. Many diaper bags topple over when they aren’t full, but due to its rectangular shape and internal frame, this bag can sit upright on its own. Interior is easy to clean. Eleven pockets throughout the bag. Outside rear pocket is the perfect place for passports, phone or wallet. Multi-functional items are great for saving time, money, and space, and this diaper bag seems to fit that niche well. If your little one is less than a year old, this bag might be a practical option. The bag has three main functions. You can use it as a travel bassinet: the side panels protect your baby for a safe nap or playtime, making it great for camping weekends. By folding down one end, the bassinet can be switched into a changing area, allowing you to dress or tend to baby’s diaper needs on the move. 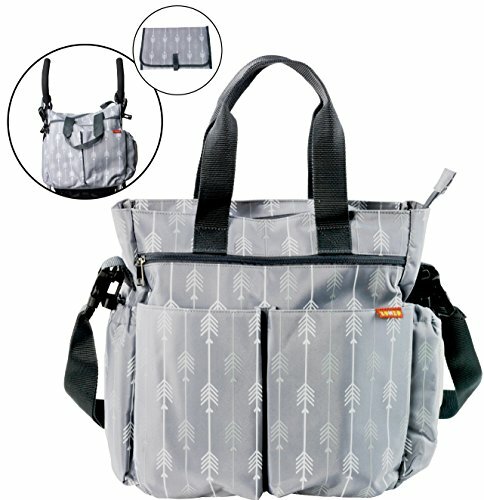 It’s a well thought out design and only takes about 30 seconds to fold back into a regular diaper bag. Thick, waterproof and easy to clean mattress. Insulated pockets to place your baby’s milk bottles. Heavier than other diaper bags. Your baby will quickly outgrow the bassinet size. 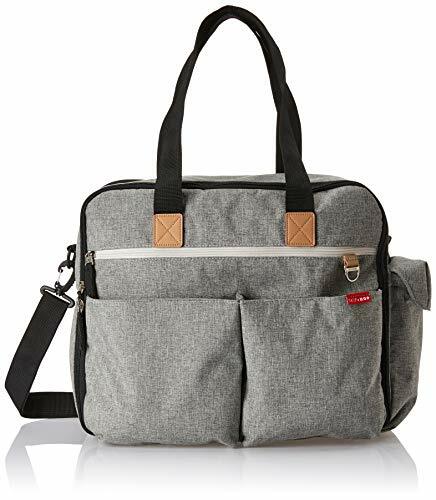 Are you going on vacation and need a diaper bag for dad? I love the fact this one has been designed to look like a regular hiking bag, with plenty of dad appeal. The padded straps make it very comfortable to wear, and you can also adjust them for a better fit — great for big days out. The clamshell style opening allows the bag to unzip and lay flat like a suitcase, which means dad should be able to find what he needs with little effort. It also makes packing so much easier. 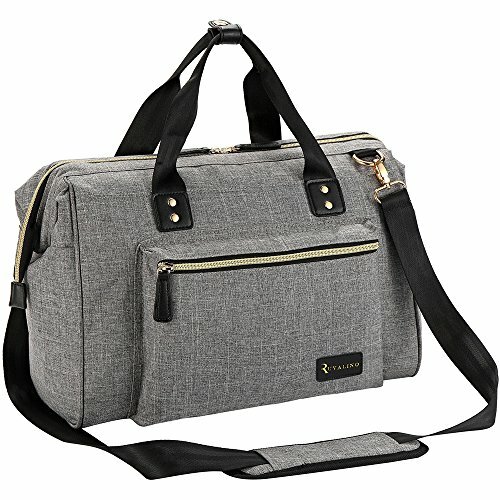 Where most diaper bags can fit small baby bottles, each side pocket on this bag can fit either a full-size bottle or two smaller bottles — perfect if your baby is older, or has a big appetite. Light colored interior for better visibility. Can’t be worn messenger style. Travel expenses combined with baby’s needs can add up. For parents looking for lots of features on a limited budget, the Zohzo could be one option to consider. I love Zohzo’s sophisticated yet simple style. The stroller straps and padded changing mat also carry on this theme. This budget bag doesn’t scrimp on storage either — there’s plenty of space for your journey’s essentials without it being too bulky. It has 11 pockets to keep everything in order, including a bottle pocket and that all-important pacifier pocket — so you know exactly where to find it in a hurry. You can drop baby wipes into the large pouch on the outside, which is suitable for most brands. Its convenient position has been chosen to avoid having to delve inside the bag — freeing up your hands. Stands upright on its own. The dark-colored interior makes things tricky to find. The YuHan is designed for moms looking for a smaller yet well designed diaper bag. 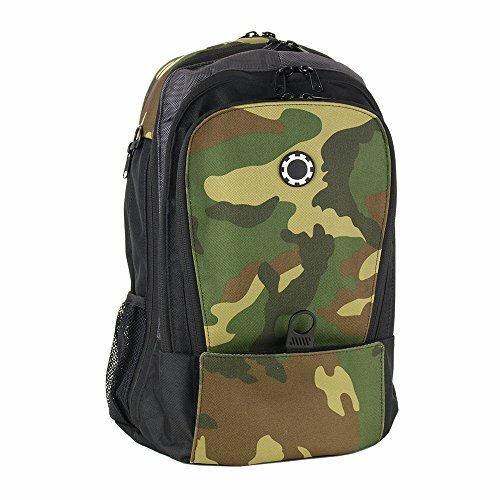 Although it has a large capacity, the bag is still light and not at all bulky. It comes in various designs — to suit mom or dad — and is made with durable, waterproof material, making spills easy to clean. The YuHan diaper bag has been designed with convenience and large storage space in mind. The wipes can be placed in a magnetic side pocket, for easy reach. There are four insulated pockets for bottles, which should keep your little one going for quite some time — like on long road trips or flights. It also has reinforced straps, making it comfortable to wear on a daily basis. Sixteen pockets available throughout the bag. Can be a bit small for some moms. Traveling with kids demands an extra level of organization, but it isn’t impossible if you’re properly equipped. My all-time favorite travel bag is the Ruvalino travel backpack. I love being active, so for me, the backpack style is my go-to diaper bag. Not only does it look good, which is important for moms, but it’s versatile too — with pockets galore and handy accessories. Plus there’s plenty of room for all the things you need when on the move. I hope this information is helpful and will save you some time while searching for a diaper bag for your future adventures. We’d love to know which one you picked, so leave us your feedback below! 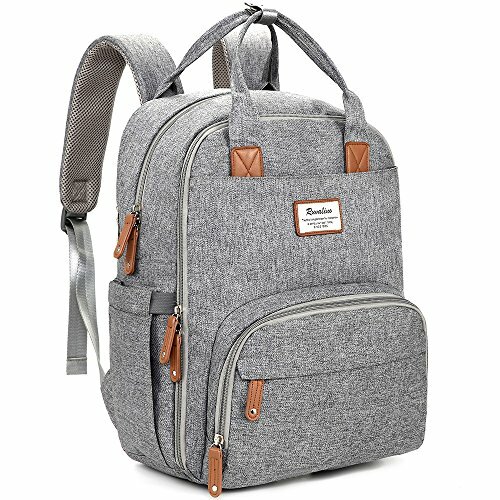 What are the Best Backpack Diaper Bags? What Are the Best Diaper Bags for Twins?